Photographs and Mementos from the Freedom B. Goode Collection. 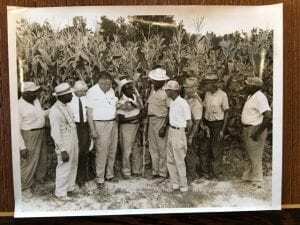 Goode served for 39 years as the first African American unit director of the Virginia Cooperative Extension office in Gloucester County. He contributed to the growth and improvement of Gloucester, including initiating the Parks and Recreation and Community Education Departments. As an avid photographer, Goode captured events in the community from his farm extension work to proms and church functions. 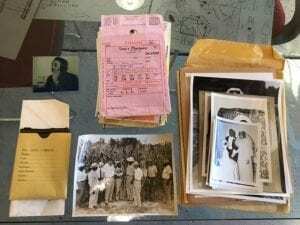 The Freedom B. Goode Collection was recently found and donated to the Fairfield Foundation by Lisa and Jay White, who purchased the 1940s house of the late Mr. and Mrs. Freedom B. Goode in Gloucester County’s downtown historic district in 2018. Items in the Freedom B. Goode collection have been stored in a damp basement for several years and were victim to an accidental flood event while the house was vacant that hastened the growth of mold and overall decay. All of the images and equipment need proper cleaning, care, and storage. Several images contain mold and mildew. Some images and documents have water damage. The greatest threat to all of the materials in the collection is continued deterioration from improper storage. After receiving this donation, Fairfield Foundation staff members sorted the images and mementos from the collection at its museum the Center for Archaeology, Preservation, and Education (the CAPE). While the items were being organized and processed, the foundation received a visit from Gloucester County School Board member, Brenda Mack. The Fairfield Foundation shared with Brenda the collection and learned that she was life-long friends with the Goode family and put the organization in contact with Freedom B. Goode’s daughter, and her childhood friend, Portia. 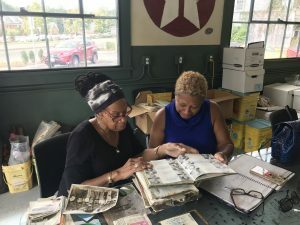 With the assistance of Portia and Brenda, the Fairfield Foundation has been able to review items in the collection and make some initial connections with the people in the images. To vote for Images of African American Life in Mid-20th Century Gloucester County: Photographs and Mementos from the Freedom B. Goode Collection, you may visit www.vamuseums.org to read all about Virginia’s Top 10 Endangered Artifacts OR you may just click HERE for the page with the directions, just scroll down and you will find FAIRFIELD FOUNDATION, enter your email (the first time you will have to confirm) but then you may vote everyday until January 31. The public is invited to vote for their favorite Virginia’s Top 10 Endangered Artifact in an online voting competition January 22-31, 2019. The two artifacts receiving the most votes during this ten-day crowdsourced competition will be recognized as the People’s Choice Awards and receive $4,000 and $3,000 respectively to conserve their artifacts and care for their continued preservation. Remaining honorees will be eligible for other monetary awards provided by the selection committee. The People’s Choice Awards recipients and remaining honorees will be recognized during a special reception at the Virginia Museum of History and Culture in Richmond, Virginia on Thursday, February 7, 2019 at 6:00pm following Virginia Museums Advocacy Day at the General Assembly. Virginia’s Top 10 Endangered Artifacts is a project of the Virginia Association of Museums and was originally funded through an Institute of Museum and Library Services (IMLS) Connecting to Collections Statewide Implementation Grant. Due to its success, the program has been replicated in other states and recognized as one of the most successful outcomes of the Connecting to Collections grant program. Over the past seven years, the Virginia Association of Museums has successfully promoted awareness of collections care and the ongoing efforts of museums, libraries, archives, historic sites and other collecting institutions across the Commonwealth of Virginia and District of Columbia to care for their cultural and historical treasures. In fact, over a 160 organizations have benefited from participating so far. The spotlight that the program has shown on the necessary long-term stewardship and expense necessary to care for our shared past has generated extensive publicity, new supporters and volunteers, and access to funding to conserve and preserve these artifacts.